Flexinol, also known as Muscle Wire, is a strong, lightweight wire made from Nitinol that can be made to contract when conducting electricity. In this article I'll present an approach to precision control of this effect based on controlling the voltage in the Flexinol circuit. In addition, taking advantage of the fact that the resistance of Flexinol drops predictably as it contracts, the mechanism described here uses the wire itself as a sensor in a feedback control loop. Some advantages of eliminating the need for a separate sensor are reduced parts count and reduced mechanical complexity. The information here follows on earlier discussions: Flexinol and other Nitinol Muscle Wires and Flexinol Control Circuit Using PIC 16F690 and ULN2003A. You might want to refer back to those articles for an introduction to using Flexinol in design and an overview of the properties of this unique alloy. Built around an Arduino Uno, the setup I've put together to experiment with is very simple, and hopefully easily repeatable. To drive the Flexinol, it makes use of a homebrew digital to analog converter (DAC) that can be assembled from common parts. 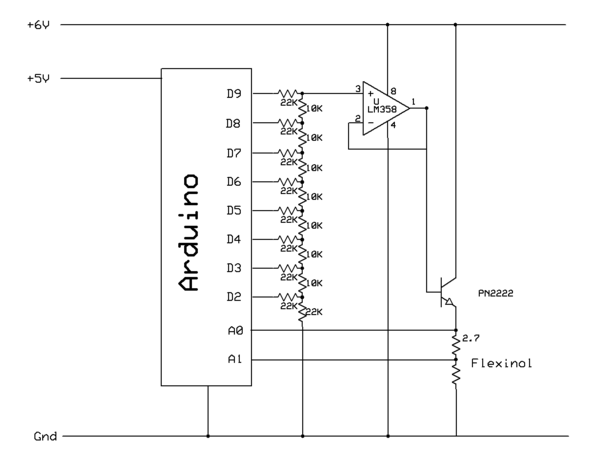 To calculate the resistance, the Arduino's native analog to digital (ADC) peripheral is used to measure the voltage drop across the Flexinol. The control code for the circuit first self-calibrates, and then steps through a set of targets attempting to hold positions across the range from fully relaxed to fully contracted. Throughout the run, data is sent to the Arduino serial monitor for observation and study. Achieving precise, low-jitter position control of a Flexinol mechanism turns out to be surprisingly difficult. Although in robotics projects, Flexinol's contraction is usually driven by electricity, the shape memory effect that causes the contraction is actually a function of temperature. In an aptly named phenomenon called resistive heating, electric current makes the wire get hot and it contracts. All by itself, controlling resistive heating in a thin length of wire is elusive, involving variables such as ambient temperature, air flow, altitude and even humidity. Beyond those environmental basics however, controlling the Flexinol requires a reasonably thorough understanding how the wire will actually respond to changes in temperature. In the on-off model of Flexinol control used in most hobby projects, we typically give the wire more than enough electric current to heat it and fully transition to the contracted Austenite phase. We then remove electricity entirely to allow the wire to cool and transition to the relaxed Martensite phase. Fortunately for the effort at hand, Flexinol does not simply transform at a particular temperature, but rather the effect is incremental across a rather wide temperature range. The full temperature span varies by the formulation but is typically between 40-70 degrees Celsius. Adapted from the Flexinol specifications document, the above chart shows temperatures in Celsius plotted against the percentage of contraction for high temp Flexinol. 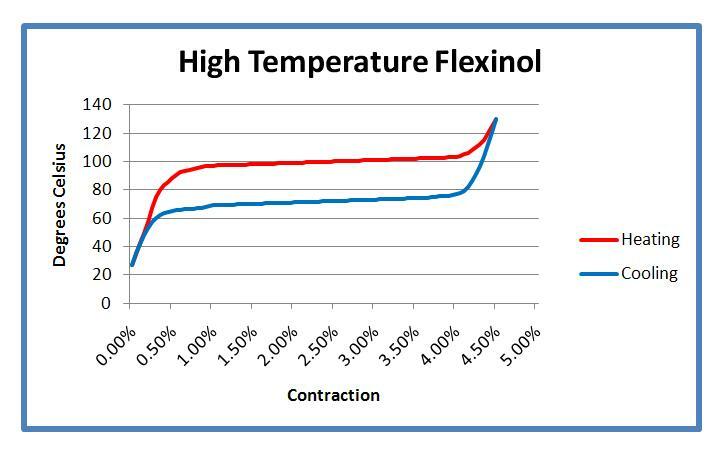 Immediately apparent is the fact that the temperature response of Flexinol is non-linear. It begins gradually, accelerates to the point where most of the useful physical transformation takes place over about a 10 degree change in temperature, and then tapers off. A second observation is that there is a significant difference in the transformation temperatures when Flexinol is heating to the Austenite phase compared to when it is cooling to the Martensite phase. When heating, the mid-point between fully contracted and fully relaxed is at about 100 degrees; when cooling, the mid-point is about 70 degrees. This 30 degree gap is known as the transformation temperature hysteresis. Also to be considered is the fact that when the current being supplied to the Flexinol is changed, the temperature doesn't change immediately, it needs time to either warm or cool. Therefore, when current is changed Flexinol will not move immediately to the new position, but will continue contracting or relaxing for a number of seconds. If we continue to change the current while the Flexinol is still settling, then we overshoot the target and the mechanism ultimately swings back and forth across the target rather than holding steady. Overshoot is further complicated by transformation hysteresis and heat dissipation issues. Typical approaches to feedback control where the current is proportionately increased or decreased until the desired position is reached won't work very well here. In the solution presented here, transformation temperature hysteresis is accounted for by calibrating such that for a given position there is both a predetermined warming voltage value and a predetermined cooling voltage value. If the Flexinol is too relaxed to hold the target position then the warming value is fed to the DAC. If the Flexinol is too contracted for the position then the cooling value is fed to the DAC. The warming and cooling values are determined in a calibration process each time the program is run. The first step in the calibration is to establish a baseline by measuring the resistance of the Flexinol when it is fully relaxed and fully contracted. In the second step, voltage to the Flexinol is steadily increased and then steadily decreased, all the while calculating the resistance of the Flexinol. When certain target resistance values are reached, the DAC values are stored in a lookup table. In making the calibrations, the current is changed at a moderate pace, a compromise between giving the Flexinol time to settle at the new position while still moving quickly enough to be useful. Although this approach does not completely eliminate overshoot, by sampling relatively continuously at high resolution and switching between warming and cooling current as needed, jitter in the mechanism can be reduced to trivial levels. Pictured nearby, the mechanical part of the experimental setup consists of a ~5.9" length of Flexinol attached to the short end of lever. When the Flexinol contracts the arm rocks upward; when it relaxes gravity acts as the bias force and stretches it back into shape. I'm using 0.005" diameter, high temperature Flexinol. According to the specifications, this wire has a resistance of 1.9 ohms/inch, a current of 320ma will cause it to fully contract in about 1 second, and it will relax in about 1.4 seconds with the current removed. On the electronics side, current to the Flexinol is controlled by varying voltage. Because we'll be measuring resistance in the circuit, we need a nice clean voltage. To control the voltage I've setup a resistor ladder DAC (frequently written R-2R). An R-2R DAC is a clever construct that enables you to build up a DAC of theoretically any resolution simply by adding "rungs" to the ladder - 8 rungs equals an 8-bit DAC. Binary values are fed into the ladder by toggling eight digital pins from the Arduino, and a proportionately corresponding voltage is available at the output. The ladder is a resistor network built up of two values, one the double of the other. Here I've used 10K and 22K values, which it turns out is close enough. The other components of the DAC portion of the circuit are an LM358 operational amplifier and the PN2222 transistor. They are both setup as voltage followers in order to get enough current gain to supply the Flexinol. In my test circuit, I'm powering the Arduino through the USB programming cable and feeding the DAC with a separate 6 volt supply. Finally, the circuit feeds a voltage divider made up of a fixed value resistor (2.7 ohms) and the Flexinol which acts as a variable resistor. This calculation is pretty easy to code on the Arduino. The first step is to take readings using analogRead at A0 and A1. Those readings can then be converted to voltages by multiplying the values by 0.004883, which is equivalent to 5/1024 or reference voltage/ADC resolution. Although the calculation itself is simple enough, it is here that we run into the limitations of both the test circuitry and the 10-bit ADC of the Arduino. According to the specifications the difference in resistance between Austenite and Martensite phase should be about 20%. Experimentally I've determined that in this particular circuit the actual useful range will be closer to 15% or about 1.5ohms for this length of wire. Therefore in order to produce useful results, measurements need to be accurate to within a tenth of an ohm, or better yet several hundredths. With this setup we just barely get there. Although not perfect, the results of the experiment are quite good. According to data culled from test runs, the setup is able to reliably hold the Flexinol to a variance of <0.1ohm from the target value. Observing the mechanism while testing, there is occasional jitter when moving to a new position, but overall the arm is held solidly with no discernable movement. As it stands the technique could be applied in numerous projects where incremental positioning is needed, but extreme precision is not required. There are many opportunities for improvement, some of which are simply a matter of substituting higher quality components and building permanent rather than prototype circuitry. It seems likely that continued experimentation and refinement of the approach in both hardware and software will enable greater precision. Although there is probably limited value in reproducing the experiment exactly, the code is reasonably well commented and a carefully read should help make some of the notions described in the body of this article a little more clear. This sketch is part of an experiment in precise control of Flexinol (also known as Muscle Wire). the resistance at any given moment can be used to determine the current state of contraction. 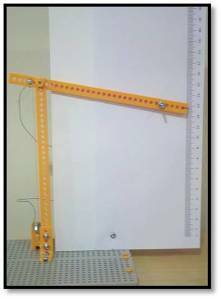 values to control the position of the Flexinol mechanism is tested. contracted then the cooling value is used. and deviations from the target which are output to the terminal along with the other data.